Heavy-duty carbon steel structural tube main frames with a single lower support frame. Sanitary frame design with horizontal tubes turned 45° into a “diamond pattern” to assist with equipment cleanliness. 2-ton Harrington electric chain hoists with motorized trolleys and nylon energy chain packages. 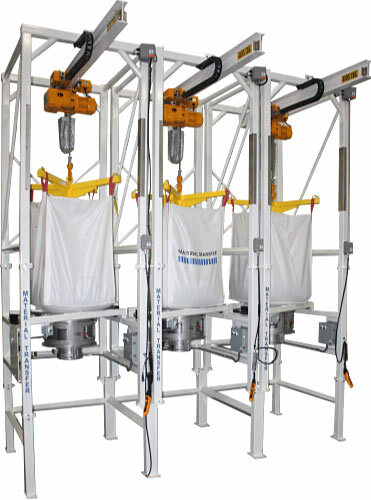 Spider-Lift™ bag lifting frames easily accommodates a wide range of bag sizes. Carbon steel bulk bag support pans with welded tubular supports for operator safety. Aluminum Flo-Lock™ discharge gates quickly halt material flow, allowing bag to be retied, removed, and reused. 304 stainless steel 24″ O.D. Seal-Master™ bag spout access chambers with “gull-wing” doors and include viewing windows. 304 stainless steel Sure-Seal™ pneumatic spout clamping systems seal bag spouts for dust-tight discharge. 304 stainless steel product discharge transitions with tool-less removable BFM food grade flexible connections (Not shown). Discharge transitions include a round UHMW cover for use when bag is not in place. Carbon steel NEMA 4 system control panels. Unit painted White using an industrial FDA approved two-part epoxy finishing system.